Besides running ads in the Ontarion, ECHO weekly, and the Bookshelf's bimonthly "Off the Shelf", MEOW! was profiled in the Guelph Mercury last week. 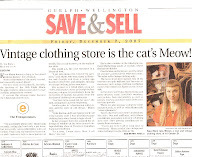 As a followup, the Mercury article was reprinted in the free weekly "Save and Sell", sort of like the Pennysaver, but published by the Mercury. Or sort of like "The Springfield Shopper", if you are a fan of the Simpsons. Anyway, because everyone in Guelph gets the Save and Sell delivered for free to their home, and because the article was reprinted on the front page, more people saw it the second time around. Pretty neat, since MEOW! is all about the second time around, in a way. The store is doing well so far --thanks to everyone who has come in and thanks to everyone who has helped spread the word. Hopefully the store will finally be totally "done" for the New Year. We have added a new showcase full of vintage beaded handbags and purses, antiques and collectibles, and pop culture novelties. We still unpack boxes of party dresses and fun winter-wear everyday, and people have started to consign some really neat stuff. If you would like to pare down your wardrobe or get some extra cash, MEOW! is accepting gently used, clean women's clothing and accessories, and will split the proceeds 50-50 if your item sells in the shop. We are very excited about the holidays and all this snow! Drop by and check out our slowly evolving Xmas decorations and take a gander at our jewelry and unusual giftware (we even have a selection of classy vintage men's cufflinks!). We also offer gift certificates. Take care, we love and value all of our friends and customers!